The fastest help desk software you'll ever use. Start your free 30-day help desk software trial. No credit card required. No strings attached. "NetHelpDesk's flexible approach has allowed us to seamlessly replace the existing system whilst maintaining service to our customers. The training and consultancy services provided allowed us to train all staff involved, identify and develop areas of improvement." "Having 350 Technicians, 16 mailboxes, 1200 Internal customers and handling 93,000 public calls (2014-2015), NetHelpDesk allows SEPA to efficiently transfer calls from our Communications centre to the correct department and ensures our customer enquiries are tracked efficiently." NetHelpDesk provide ITIL aligned help desk software that can be installed on premise or in the cloud. 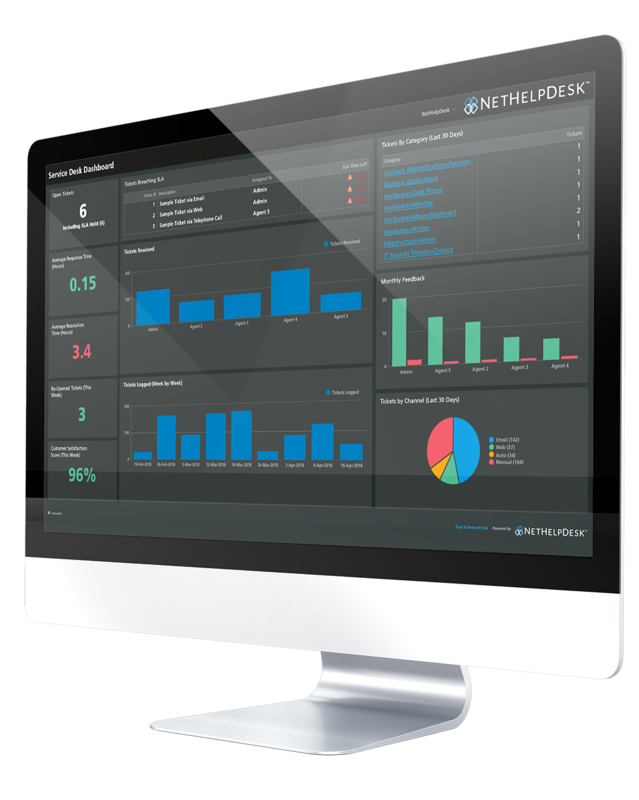 Through over 20 years of experience, NetHelpDesk has been developed to offer a feature rich application whilst maintaining a simple to use interface. Features include: incident, problem and change management, asset management, CMDB, service catalogue, telephony integration, mobile apps. NetHelpDesk provides a platform to deliver excellent customer support whilst increasing agent productivity. One-click Data Migration and Import into our ITIL aligned setup. 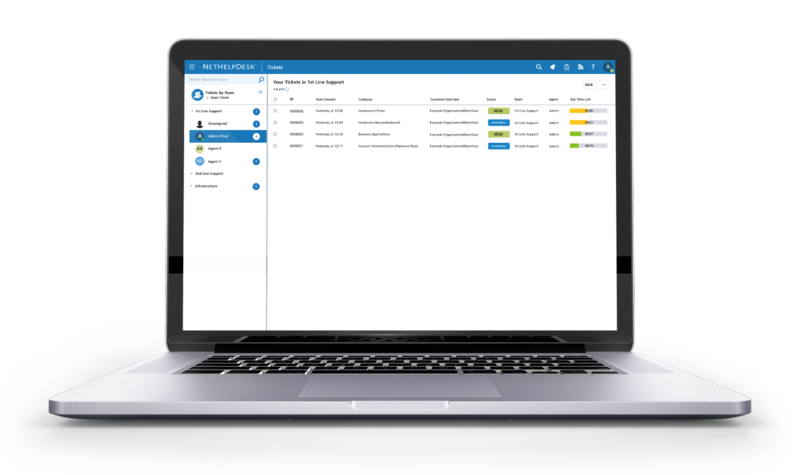 Ticket and Asset Management all handled from the same interface. Industry leading smartphone, tablet and phablet apps free to download and use. Calendar 2-Way Sync with Exchange, Office 365 or Google Calendar. Endless Reporting on any data you have stored in the NHD database. Quotations and Sales Orders created directly from tickets, or ad hoc. CRM and Sales Leads Tracking, with conversion probability and value. Multiple Site and Time zone support for your international customers. Customisable End-user and Tech Web Portals via any browser. We provide premier support and our team of consultants are ready to assist with your transition to NetHelpDesk. Whether it is implementation, customisation, ITIL consultancy, on-site and/or remote training, process streamlining, data migration, or your favourite third-party application integration with our help desk solution. We want to help make the move as smooth and hassle-free as possible. When joining NetHelpDesk, you will be assigned an Account Manager, and a dedicated support Agent. Our team are invested in making NetHelpDesk a success for your company, and so we really do care about your business, and what is best for you. Your success is our success. We want you to be with us for many years to come, so we treat you with the respect you deserve. Unlike our competitors, we give you all modules, all functionality, as standard. That's right. You read that correctly, don't worry. There are no hidden costs. As we add new features to the help desk product for other customers, you benefit from having the option to upgrade to the latest version at no extra cost. Read through all the release notes to see if it's the right move for you, and all you need is an up-to-date maintenance contract. That's it. NHD can be tailored to literally any industry or company type. Some of our large global customer base include non-IT related companies, such as energy management, restaraunt chains, facilities management, human resource companies, and many, many more. You can customise fields and create new tables in virtually all areas of the product, and produce customised web interfaces for your end-users with all your own corporate branding. With so many amazing products on the market, our help desk software has already integrated with some of the biggest names in software, including QuickBooks, Sage, KashFlow, Xero, MAXfocus, Kaseya, N-able, LabTech, LogMeIn, TeamViewer, VNC, Remote Desktop and many more. Tell us which products you prefer to use, and we'll help integrate it for you! No software fits your needs perfectly, and most help desk solutions will probably match between 70-80% of your requirements. It will also mean you having to change the way you work around the software. Not with NetHelpDesk! Tell us what you need to make NHD at 100% fit and we will deliver. This is usually free of charge, and delivered within 28 days of the order being placed.